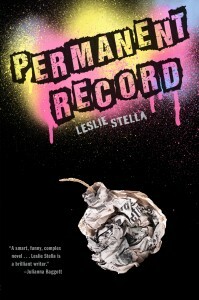 I’m thrilled to have Leslie Stella, author of PERMANENT RECORD, here on my blog. I got a chance to read a sneak-peek of PERMANENT RECORD on my Kindle and fell in love with not only the story, but the characters, which became alive and real for me by the time I finished the book. 1) What inspired you to write PERMANENT RECORD? The escalating amount of school violence in our country, especially since Columbine, is horrifying. You see the faces of these killers all over the news with little to explain how they got there. I couldn’t stop thinking about it: how did they get to that point? Bullying, mental illness, lack of love, lack of family? I wanted to explore several themes that don’t fit neatly into talk-show soundbites or the ticker on news programs: 1) Bullying, and the fine line between standing up for yourself and taking revenge, 2) the cyclical effect of bullying and school violence, and how they feed off each other, and 3) the perpetrators themselves, and the idea that someone who fires back at those who have hurt him may not in fact be a monster, but a wounded human being. As a teacher, my heart breaks for those who have these kinds of needs and I love how you have shown us through PERMANENT RECORD that each person is real and has needs. 2) I think one of my favorite components of PERMANENT RECORD is Bud. He’s such a rich, complex and utterly original character. What instigated you to develop such an individual? I wanted to see a put-upon, trashed-by-life kid struggle against his darker urges, someone who desperately tries to be a good guy despite having, as Bud puts it, “a brain that misfires.” He grew from what began as a caricature in an earlier novel of mine, which I cannibalized to write PERMANENT RECORD. Even in that early, rough form, he had that very appealing quality (to me, anyway) of struggle: a good person who does bad things, a bad person who does good things. It also helped that we are alike in some ways, having both grown up disadvantaged by that one-two punch of being weird and shy. We also have common interests in Dungeons & Dragons, botany, and minor explosives. 3) I also love how you don’t shy away from tough issues that teens face in schools these days such as suicide, hazing, and racial discrimination. What instigated you to bring these issues into the book? As you said, these are real issues that real teens face. I’m not making this stuff up for the sake of a story. I realize not everyone has these same experiences, but for God sake, we’re human beings, and I hope we can empathize with what other people go through. For example, I was never bullied to the point that Bud was, but I received my share of suffering at the behest of my classmates. Crippling introversion and being known for being strange doesn’t make for an easy adolescence, but on the other hand I didn’t have to deal with a physical or mental issue that would call up daily shitstorms of abuse. But there are people—teenagers; children—who have those issues, and who do endure that kind of daily abuse. 4) What was the most difficult part of writing PERMANENT RECORD? The most difficult part was writing the scenes where Bud treads that line between standing up for himself and revenge. I had to throw out or rewrite a lot of scenes where he reacted too strongly, did things that were ultimately cruel and out of character for him. Bud is definitely a hero—a flawed one, but a hero. I had to keep that complexity in his characterization. 5) If you could have your readers come away with at least one theme from PERMANENT RECORD, what would it be? 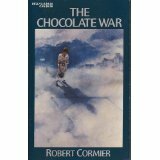 Bud is powerfully moved by the book THE CHOCOLATE WAR by Robert Cormier, which he describes as a realistic portrayal of human cruelty and conformity. Its school setting is an ominous portent for life after high school, for some of us. So I would say, if you haven’t read THE CHOCOLATE WAR by the time you’ve turned 25, there may be something seriously wrong with you. 1. Favorite type of chocolate: Nothing sold as a fundraiser by any organization. 2. #1 country you’d like to visit: I have a pathological fear of travel; even this question is sending me into an anxiety attack. 4. Preferred writing method: (i.e.) computer, pen, pencil: Laptop in the silence of my local library’s quiet-study room. Thank you so much for coming by and chatting Leslie! Great interview! This sound like a powerful book. I saw this on Netgalley was really intrigued. Whether it’s the ARC or actual book, I’d love to read this in the future. This is a very important issue, and I’m glad to see a book about it. Since the boy is Iranian, I’m wondering if religion was included the storyline. I’d love to see a Muslim hero in a book. They get too much bad press. Thanks so much for spotlighting Leslie and her new novel. I’m adding it to my TBR list now.